Let me disagree with some music theory books that claim pentatonic scale, which is a scale with five notes per octave, being a sequence of perfect fifths, not to be the most ancient scale. 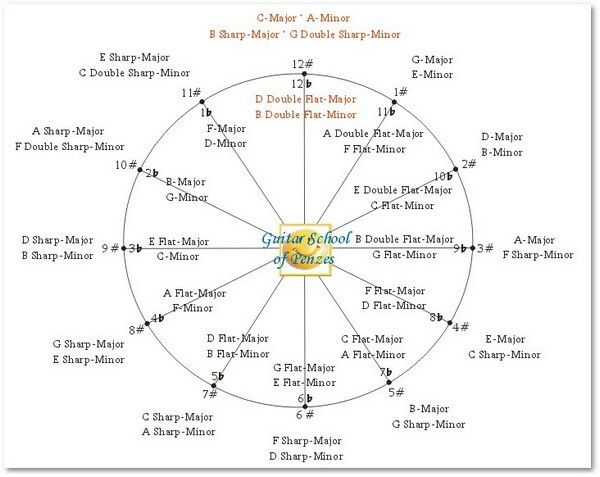 Starting these fifths intervals from note C, you can get the notes of the circle of fifths, practically all the twelve different notes. The ancient Chinese already recognized this. Just for the record, the ancient Greek even knew the quarter-tone steps (more on this in section The origins of the basic scales). In addition, a 20th century Czech composer named Alois Hába was also known for his experimental work on a similar tonal system, which is considered more like some kind of a recitative than pure music, at least in my understanding. I want to note that later on I intend to make similar experiments, that is experimenting with different tonal systems, and publish them in section Fretless guitar II. Playing only the black keys you will get a pentatonic scale. It is the Music of The Universe, the pure and ancient musicality itself. As an evidence of the aforementioned, the ancient Chinese civilization, which stretches back to thousands of years in the past, has considered the pentatonic system a basic system for their music, which evidences from as early as 3000 BC prove. Plus, the pentatonic system has also given the base to the blues genre, originated from African-American communities, and the Hungarian folk music. All in all, the pentatonic system is ancient and intuitive.